The packages can also be customized to your needs, what you need or want us to have or have exclusive access to. Unlike other Cartagena Bachelor Party Packages providers companies in Colombia, we actually live here and we all speak English! Our competitors operate out of their office by calling different suppliers mixing and combining all the services together, we are a company that works towards perfection for a unique and unforgettable experience. 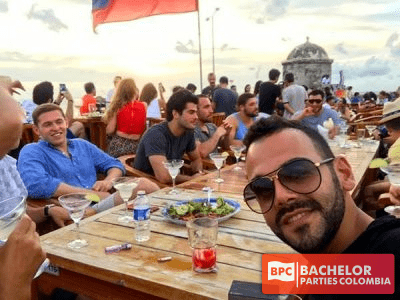 Keep in mind that all of our Cartagena Bachelor Party Packages have access to the best of what the city has to offer and we want to say everything the city has to offer! We make it easy, Just choose a package! We'll do the rest! ...And We Will Do It Great!!! The Best and Biggest Mansion in Cartagena located in the historic center known as the old city, where are all the most exclusive clubs, bars, restaurants and the famous "Cafe Del Mar", and do not worry, it will be only six blocks from the beach, without a doubt this is the best option of all. But if you like other options, we can offer you in Getsemani or Boca Grande a few minutes from the old city. Island hopping style in our 100ft Luxury Catamaran: This tremendous catamaran is perfect for incredible parties on the water for you and your friends.